We strive to give our customers a great experience, not only with a delicious home cooked meal, but with great service and a promise that your visit will be worth your time and money. 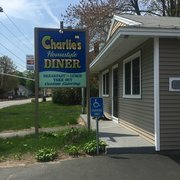 We love Charlie’s Diner and we want you to love it too! “Charlie’s Diner” is named after Kevin Hadley’s son. Located in beautiful Merrimack, NH, our establishment serves breakfast and lunch. We also offer customized catering as well. Open seven days per week from 6am until 2pm and on Sunday 7am until 2pm. Breakfast is served all day. Lunch begins at 11am. Fridays we serve fresh haddock. Sundays we serve breakfast only.